This article may contain outdated information that is inaccurate for the current version of the game. It was last updated for 1.18. The HRE in 1444. The emperor is in purple. Electors are orange. Free cities are blue. Dark green are Imperial provinces, owned by HRE member-states or otherwise. The Holy Roman Empire (HRE) is a unique political structure in the game, made up of numerous variously-sized states of the Germanic region and northern Italian Peninsula in Europe. Members are considered 'Princely states' and their heads are 'Princes'. From these Princes, up to seven are Prince-Electors, who vote on which Prince will be the next Holy Roman Emperor upon the death of the previous one. The Holy Roman Emperor has various powers at his disposal and a great deal of responsibility to maintaining and protecting the Imperial territorial, religious, and cultural status quo. In the Common Sense DLC, the Emperor can appoint up to eight Free Imperial Cities which are OPMs, cannot be electors, and give the emperor more authority in exchange for trading bonuses (for example, Ulm). Historically, the Empire existed from the 10th to the 19th centuries, and had up to 300 members at some points, many of which were so small (e.g. the grounds of an imperial abbey) that they are not represented in EU4. The first Holy Roman Emperor, Charlemagne, was crowned "King of the Romans" in Rome by the Pope in the year 800, but it wasn't until 962 that the HRE as a united polity came into being. It considered itself to be the spiritual successor state to the Roman Empire, even though throughout the majority of it existence it never directly controlled Papal Rome (and also despite, up to 1453, the continued existence of the Eastern Roman Empire and until the late 15th century of various Byzantine holdout states such as Trebizond, Theodoro, etc.). It experienced high amounts of decentralization towards the end of the Middle Ages, which is represented in-game by the special HRE mechanics (see below). The balance of power between the various Princes, Electors and the Emperor was always in flux, and imperial unity was further weakened by the Reformation. From the 15th century on, except for a handful of years under the house of Wittelsbach (during the early years of the reign of Archduchess Maria Theresa) the Emperor was from the House of Habsburg or Habsburg-Lorraine, the rulers of Austria and many other European nations. This section may contain outdated information that is inaccurate for the current version of the game. The last version it was verified as up to date for was 1.18. The Holy Roman Empire Interface, showing Austria as the Emperor, six electors (all voting for Austria), seven Free Cities, and 31 other princes. Religious leagues are forming: on the left, the Catholic League led by the Emperor (Austria); and on the right, the Protestant League, here led by Denmark. The green tick indicates that the player is a member of the Catholic League. The Holy Roman Empire interface is a small shield (with a picture of an Imperial eagle) on the bottom of the screen (only visible as long as the HRE exists). Under the icon is a number which shows the Authority of the current reigning Emperor. Within the interface are a number of shields of various sizes representing members of the HRE. Each of them can be clicked on, which will bring up the Diplomatic interface to examine and interact with that nation. Religious state: At top centre is an icon indicating the current state of religious law within the Empire. At the start of the game, this is a gold cross indicating that the Catholic faith is official. When the religious league forms, it changes to an icon indicating a "state of Religious War"; when this state ends, it changes again, possibly back to Catholic, to Protestant, or to an icon reflecting that "a treaty of permanent religious peace has been established". Current Emperor: The large shield in the upper left corner shows the blazon of the country who is currently the Emperor. Beside that is the percentage of current Imperial Authority, ranging from 0 to 100, and below it the amount of Imperial authority earned per month. The higher the value, the more respect the Princely states of the Empire have for the Emperor. Beneath the shield, the game will state specifically the name and nation of the current Emperor, e.g. "X of Y is the Emperor". Imperial Actions: Hovering over the dove icon to the left of the Emperor's shield shows what special actions are available to the Emperor. Benefits: Hovering over the icon of the Imperial Crown to the right of the Emperor's shield shows the current benefits granted to the Emperor and to princes. Imperial Authority: The large white number in the centre of the interface shows the current Imperial Authority to two decimal places. Hovering over it shows a list of factors that can affect it. The red or green number below it shows how much Imperial Authority changes each month, and its tooltip shows the factors that currently affect it. Reforms: On the right is a list of possible imperial reforms, with a green tick next to any that have been passed; their tooltips show the reforms' respective benefits for princes and the emperor. They must be passed in order from top to bottom. An envelope icon on the right has a tooltip showing which princes are in favour of or against the next reform, and can be clicked by the Emperor to pass them. Members other than the emperor have a box next to each reform that can be ticked to vote in favour, or unticked to vote against. Electors: These are the seven princes that have the power to elect the next Emperor. Underneath each of their shields is a smaller shield, representing that elector's current choice of successor to the Imperial crown. They can vote for themselves if eligible, or for other nations. Dependent Electors will almost always vote for their suzerain overlord if eligible, even if they are not part of the Empire. Next to it is a number which represents that Elector's current support of the player's own ruler as successor. This will range from a positive number, which means the Elector favors the player's ruler over all others, to a negative number indicating someone else is favoured, to less than −1000 if the player's ruler is ineligible to be Emperor. Hovering over the shield will display a tooltip showing all the factors that play into the elector's current attitude towards the player and the elector's (next) favourite. Princes: Below the Electors is a display of all the shields of the current member states of the Empire. This number can shrink or grow over time as member states are conquered or new ones find a home within the Empire's boundaries. Electors are listed first, distinguished by a seal icon with an E attached to the top left of their icon. Imperial Free Cities are listed next, distinguished by a white banner crossing behind their shields. Hovering over any of them shows their current attitude towards the next reform and a breakdown of factors contributing to it. Leave HRE: At the bottom left is a button for those who have had enough of the Emperor's meddling in their lives. Selecting to Leave HRE will take the member's nation out of the Empire and remove all of its provinces from the Empire. However, there are diplomatic consequences to such a decision. Dismantle HRE: If the Emperor's capital is controlled and the electors either have their capitals occupied or are allied to the nation attempting to dismantle the empire (almost always the player), it is possible to dismantle the Holy Roman Empire and disable the HRE mechanics permanently for 100 prestige. Religious leagues: If any Elector converts to either the Protestant or the Reformed religion, a Protestant country will form the Protestant League in preparation for religious war against the Emperor, who forms his own Catholic League. The members of these leagues are shown on panels to the left and right (Catholic and Protestant respectively). Above these panels is a button which a non-member can press to join the league (not available to the Emperor, who always leads the Catholic League). The Emperor is the leader of the Holy Roman Empire, tasked with defending and maintaining the sovereignty of member states. Friedrich III von Habsburg of Austria starts the game, in 1444, as Emperor. Emperors, once chosen, serve for life. However, if the emperor becomes ineligible, or is annexed so his/her nation ceases to exist, a new emperor will be elected. On the death or disqualification of the current Emperor, the Imperial Electors choose a replacement from within the Christian world, with the exact eligible denominations determined by the outcome of Religious Leagues. The accepted Imperial religion (either Catholic or Protestant). If the Peace of Westphalia event happens, any Christian may be chosen (although a −50 "Heretic Nation" penalty goes toward the nation's score on the electors' opinion, not to mention the relations hit), including Orthodox and Coptic nations. If there is no candidate qualifying these conditions, most often from the outcome of religious league war and all of the rulers of that religion being female, then the Empire is automatically dismantled and the HRE ceases to exist. Notably, being a member of the Empire is not a requirement, though electors will usually prefer members. Election happens immediately once a new Emperor has to be chosen and the candidate with the majority of votes wins the election. In case of a tie in the number of votes, the current emperor retains the title. In case that candidates who are not Emperor are tied, the country with the higher prestige wins the election. An Emperor cannot lose the election for Emperorship while in the midst of a League War. Additionally, the Emperor may core any province within the Empire, even if it's out of coring range or inaccessible. This action gives the Emperor a +41 relationship modifier with another nation within the Empire at the expense of −1 Imperial Authority. This relationship bonus will disappear if the country stops being emperor. Available from the Holy Roman Empire interface, the Emperor can call for a vote on an Imperial Reform. Unlike in EU3, the Emperor can see how the members of the Imperial Diet will vote before calling for the reform by hovering over the reform button, and why they support or oppose by hovering over the shields of each imperial prince. A prince's decision to support a reform is largely based on their opinion of the emperor, the amount of imperial authority and the emperor's diplomatic reputation. Grant Free City status to nations in the HRE that only own one province. Free Cities get a special republican government, a bonus to tax income and will always be able to call in the Emperor when they are attacked, even in internal HRE wars. The Emperor gets a bonus to tax income, manpower and imperial authority for each Free City in the HRE, but there can only be 8 Free Cities in total at any given time. A Free City that gains a second province or leaves the HRE will lose their Free City status. Free Cities cannot be Electors. Monarchies get a −50 penalty to accepting and theocracies get −100, so getting one-province republics released may be necessary to create more free cities. A nation that feels Threatened by the Emperor will have a +20 modifier to becoming a Free City, so that they can have guaranteed Imperial protection. Friendly status or being allied gives +10, relations give up to +20 and each point of diplomatic reputation give +3. The Emperor receives a call to arms when outside powers declare war on a prince of the empire, or members declare war on each other without a casus belli. Unlike a regular Call to Arms this does not usually have an effect on prestige, but does affect Imperial Authority. If the emperor decides to refuse this call, Imperial Authority drops by −10. Regardless of the outcome, answering this call to arms gives the emperor a +50 relations boost with regular members of the Empire, and +100 with the electors. The opinion of the nation that was under attack will increase by +10 because of the honored alliance relation boost. Remove elector status from an elector at the expense of worsened relations with other electors and −10 Imperial Authority. This action is not available unless the HRE has an official religion and the elector is considered heretic. This is a diplomatic option with the Common Sense expansion, and a peace treaty enabled by a special casus belli without it. If there are fewer than seven electors in the Empire, the Emperor can appoint a new Elector in the diplomacy screen to any independent nation inside the Empire. Appointing an elector gives a +50 relations boost with the new elector. The emperor cannot make Free Cities, Subject Nations, or himself electors. Once the first imperial reform has been passed, The Emperor gains a casus belli against all non-HRE nations that control any HRE territory, such as Burgundy or Venice at the start of the game. HRE territory owned by non-members is shown with yellow diagonal lines in the Imperial map view. If an outside power conquers the target province, the emperor gains a claim on the province. The Emperor gains a casus belli against nations that annexed a member state, with the goal to liberate the said prince. Succeeding to liberate the prince will result in an imperial authority bonus. The casus belli is automatically given upon the annexation, and expires in 60 months (5 years). This is a diplomatic action which allows the Emperor to force his/her state religion on other nations within the empire that follow heretical denominations. The acceptance of the request depends on the target nation's opinion of and attitude towards the Emperor, the Emperor's diplomatic reputation and prestige, the target nation's number of provinces and whether the target is an Elector. If the target is an elector or Defender of the Faith, it counts for a −1000 points reduction on the likelihood of acceptance, effectively rendering peaceful conversion impossible. If the target accepts the request, they convert to the Emperor's state religion and one random province becomes converted automatically. The Emperor suffers a relations hit (−25 which is cumulative) with other Princes with the heretic religions of all denominations. If the target refuses to convert peacefully, the Emperor suffers a prestige hit and gains a casus belli against the target. It can only be demanded after a religion is set in the HRE, meaning that if the Peace of Westphalia is signed, this option will be permanently locked, but will be available after 1635 if the League Wars are never triggered for example (see Religious Leagues). Demanding religious unity, whatever the answer, costs 1 point of Imperial Authority. The Emperor can demand another nation, member or not, to return unlawfully held imperial territory to the Emperor, refusal of which gives the Emperor an Imperial Liberation casus belli and gives all member states a relations penalty with the unlawful land's holder. The territory is considered unlawful if the owner does not have a core on it. Denying the request will also result in higher unrest, lower tax and manpower and a negative monthly autonomy change in the recently conquered province. If target country refuse the Demand, Holy Roman Empire loses −1 Imperial Authority. Demanding causes a −100 relation penalty with the target, so it is probably worth it to let an Elector keep its spoil of war instead. If the same province is taken twice by different or same nations the emperor takes ownership of that said province. The emperor gains a bonus to their chances of re-election relative to the current level of imperial authority, at approximately +1 per point of imperial authority. Imperial authority is used to pass reforms within the Empire and perform certain Emperor actions. The Emperor needs at least 50 Authority to pass a reform and the consensus of at least half of the members of the Empire. When a reform is passed, all Imperial Authority is removed (the counter is set to 0). After the reform Proclaim Erbkaisertum has been passed, the emperor gains an additional +25% Imperial Authority to every action taken. +10 for maintaining the Imperial Crown through successive generations until the Erbkaisertum reform is passed. Note that this does include re-elections triggered by the Emperor's abdication, "manually" or due to pretenders enforcing their demands. +1 for each province added to the Empire. +0.10 monthly if there are no internal wars in the Empire. +0.005 monthly for every Free City in the Empire. −0.005 monthly for every province owned by a country not in the Empire. This also applies for provinces owned by HRE members that are (non-tributary) subjects of non-members (for example, Provence leading a PU with Lorraine, Holstein in vassalage to Denmark). Provinces owned by non-HRE members who are subjects of HRE members do not decrease IA, although they are still subject to the Imperial Ban. −0.1 monthly for every elector who is a vassal. This does not apply to electors who are junior partners in a Personal Union. −0.1 each month if there are fewer than seven electors. −10 for declining a defensive call to arms from a member being attacked by a foreign nation. Winning a defensive call to arms will grant as much as 30 IA, in addition to a substantial relations boost with every HRE member nation. Only awarded when the defensive War Leader negotiates a victory, so not on separate peace deals. −1 to Enforce Religious Unity on a Heretical member of the HRE. −1 when Demand Unlawful Territory is refused. −5 to Revoke Free City Status. −10 if a non-HRE nation annexes a member of the HRE. +25% after the imperial reform ‘Proclaim Erbkaisertum’. +25% after the imperial reform ‘Revoke The Privilegia’. +25% with triggered modifier ‘Catholic Empire’. +25% with triggered modifier ‘Protestant Empire’. If the Emperor has a female heir he can, under certain conditions, take the decision that in the future women can become empress. This is not needed if Proclaim Erbkaisertum has been passed. Historically, Emperor Charles VI, who had no male heirs, issued it in 1713 to provide for the succession of his daughter Maria Theresa, which nonetheless led to a succession war in 1740 (the War of the Austrian Succession). Our heir is a woman but the Imperial crown can only pass to a man. It would be intolerable if our dynasty should lose their hold on the crown they worked so hard to acquire due to a mere technicality. Let us use all our influence to ensure our female heir will be considered as our successor when the time comes to elect a new Emperor of the Holy Roman Empire. is a member of the Holy Roman Empire. No female can become emperor. is the emperor of the HRE. has an imperial authority of at least 25.
gets the event ‘The Pragmatic Sanction’. The Pragmatic Sanction, solemnly rendered by Emperor $EMPERORNAME$ on [GetDateText], established the indivisability of his lands and established succession by order of first born child, even to a woman. No doubt $EMPERORNAME$ also plans for his female heir to in time take his seat on the Imperial Throne. By the decision ‘Pragmatic Sanction’. We can have an Empress! Many of our predecessors on the Imperial throne have failed to assert their authority over the Kingdom of Italy. If we are to prevent the area from slipping entirely out of imperial control we must forcefully assert our authority over Northern Italy. is the emperor of the Holy Roman Empire. The event ‘The Shadow Kingdom’ has not happened before. The event ‘The Kingdom of Italy and the Empire’ has happened. The year is before 1490. All provinces of Tuscany, Emilia-Romagna, Liguria, Piedmont, Lombardy, Central Italy (except Abruzzi), and Venetia (except Venezia), plus Roma, are part of the HRE or owned by the emperor or one of its subjects. 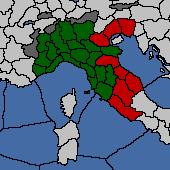 All provinces in Italy under our direct or indirect control will be added to the Empire. No state will leave the Empire through the Shadow Kingdom event. becomes a part of the HRE. The Electors are the nations that vote for the next Emperor. When there are fewer than seven electors, the Emperor may grant the electorate to another independent nation within the Empire. Electors are incredibly protective of their sovereignty and are unlikely to vote for a nation that has an elector as its vassal. The Emperor may go to war with a country in order to remove the electorate from them if they follow a heretical denomination; with Common Sense, he can simply revoke the electorate instead (and can't go to war to do it). Electors may vote for non-members of the HRE too. The imperial reform ‘Erbkaisertum’ stops further elections, making the Emperorship hereditary, but the electors keep their status. If there are no electors in the empire, hereditary rule is instituted. AI electors weight candidates according to the following criteria (non-exhaustive list), although an AI elector with the backing of another elector will vote for itself regardless, as will an elector with a "strategic interest [in] becoming emperor" (although the conditions for this are not explicitly stated). + current opinion, from −200 to +200. + Legitimacy − 50, from −50 to +50. + Imperial Authority, for the current emperor. +30 for an alliance with the candidate. +10 for a royal marriage with the candidate. −25, if a one-province minor. −25, if under 50 development. +25 or +50 for being sufficiently large and an HRE member. +5 for same culture group. −50 for heretic religion (i.e., different branch of Christianity). +50 for subject electors, towards their overlord. −50 for independent electors towards a candidate with electoral subjects (stacks). −50 for non-HRE states (like Byzantium). −200 for being a member of the opposing religious league. +10 per point of positive diplomatic reputation. −5 per point of negative diplomatic reputation. −200 if at war with the candidate. (NB: this is a severe penalty, but not automatically disqualifying). −1000 if ineligible (non-monarchy, female candidate before Pragmatic Sanction, not HRE religion or not independent, in a regency or interregnum, or the Emperor with no eligible heir). Of these, Holstein is a vassal of a non-member (Denmark), and Brabant, Flanders, and Holland are in a personal union under a non-member (Burgundy). For example, in 1444 Venice has 147 development. It also has Naxos and Corfu as vassals and their development is 6 and 9 respectively. So it requires (100 + 73 + 3 + 4 = ) 180 opinion from the Emperor to join. Since relations can't exceed 200, this means that a nation can't have more than 200 development. Since vassal's development counts, releasing provinces to vassals can not help in adding provinces or joining the HRE. Adding a new province to the Empire increases Imperial Authority by +1 as the emperor. Current member AI states that are the Emperor will add provinces to the Empire provided that they border or share a sea zone with provinces which are already members, the province religion is any denomination of Christianity, the nation has a core on the province, and the province is in Europe. Provinces connected with a water crossing can be added to the empire, as well as isolated islands provided they share a sea zone with a province already in the empire. Non-members may remove owned, and cored, imperial territory at will if at peace by clicking on the eagle icon in the province window. This lowers imperial authority by −1 and significantly hurts relations with the emperor. Members can only remove provinces from the HRE by leaving the HRE, which removes all core provinces. 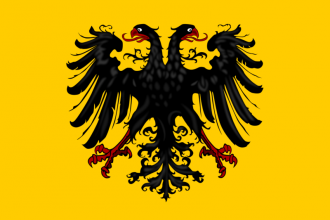 Since a nation is a member of the HRE if and only if its capital province is in the HRE, it is possible to join the empire by adding the capital province to the HRE according to the rules described above, which for non-members require the country to either be the Emperor or have sufficiently low total development (200 or less; regardless of culture) and good relations with the Emperor. Alternatively, while you can't move your capital into or out of an HRE province normally, such a move can still happen by other means like events or losing your current capital (at least if there is no other province of the same HRE status as the lost capital), and will result in respectively joining or leaving the HRE. Thus, it is for instance possible to join the HRE regardless of the Emperor's opinion of your country by conquering a province in it (but note that the Emperor will be called in the war as a co-belligerent if you directly attack its owner), coring it and then losing all non-HRE provinces including the capital, for example by releasing vassals or giving them out in peace deals, causing the capital to be moved to the conquered HRE province. Minor AI countries may rarely join the HRE if they have excellent relations with the current Emperor and they are threatened by a powerful neighbor (Ragusa in fear of the Ottomans, Gotland in fear of Lithuania/Sweden etc). Using the console command "mapmode aihre" you can see some of how the ai evaluates this decision. It seems to compare the threat level and relative strength of one particular nation that it feels threatened by, which need to be greater than 300-(2*(HRE Imperial Authority)) for threat level (maximum 400) and less than (HRE Imperial Authority)/2 for relative strength (as a percentage). It also does not want to join if the nation it evaluates for this is already a member of the HRE, even if some other non-hre nation might have the appropriate threat/strength levels, it seems to choose whichever nation it finds most threatening, and it seems to give preference to rivals and nations with cores or claims, for instance, Dauphine might evaluate for its rival Savoy instead of France, if France has no claim/core on its territory, even if it feels threatened by France. Additionally it will still consider nations which it has alliances or truces with and re-evaluates this on a monthly basis, though it seems to give these a lower priority, other things being equal. The nation's attitude toward the emperor also seems to affect the decision, and nations that are not able to reach the needed relations level dont seem interested in joining either. An example is the Teutonic Order in 1444 which needs 149 relations with Austria to join, if austria guarantees them and asks for military access they can still only reach 145 relations and will not be interested in joining, but once the event fires for them to sell their hre province back to Brandenburg, the relations requirement will drop down to 144, which is achievable and they will start working towards joining. Once it does decide to join it will do so as soon as it meets the relations requirements and can add its capital. A member state who is not the Emperor may leave at any time if it is at peace (using the HRE interface). It is also possible to leave by moving the capital to a non-HRE province; however, this cannot be done manually, but can happen by losing the capital or some events. Leaving causes non-core provinces in the HRE to be ceded to the emperor, removes all core provinces from the HRE, hurts relations with the emperor and reduces Imperial Authority significantly. Non-electors forming nations results in those nations leaving the HRE, unless they are the emperor or an elector (e.g. if Holland is the emperor, Holland can form the Netherlands without leaving the HRE). Also should the North Italian region not be entirely in the HRE by 1490 the Italian states will leave through the "Shadow Kingdom" event. Free Imperial Cities are one-province republics granted special favors by the Emperor. The game begins with the maximum number of Free Cities in the HRE. In the chance that number decreases, the emperor may appoint new ones (if the proposed nation accepts) as needed up to the maximum number of 8 Free Cities. For every Free Imperial City, the amount of Imperial Authority is increased by +0.005 monthly, and the Emperor also receives +2 annually for each city. In return, they get a special government type (breaking any pre-existing Royal Marriages with no penalty), and the Emperor is always called into war if a Free City is attacked, even if the attacker is in the Empire and has a valid Casus Belli. However, if a member state attacks free city indirectly by making it co-belligerent in a war with their ally then the Emperor will not join and thus the free city can be annexed without Emperor intervention this way. If the emperor attacks a free city, it will suffer with −1 stability. As with Electors, the empire functions properly with them at their max number. The AI will always grant the status of Free City to the maximum of 8, as long as there are 8 eligible nations. Has a single province, with at least 10 total development. If a Free City takes a second province, it loses its status. Must be a member of the Holy Roman Empire. Must not be a subject nation, such as a vassal or the junior in a personal union. Free Cities can never be vassalized, either diplomatically or in a war resolution. If a Free City becomes a vassal in some other way, it remains a Free City. Must not be an Elector. If a nation qualifies, other factors such as diplomatic reputation, trust, and government type will affect the offer of becoming a Free City. In particular, Republics are much more willing to become Free Cities than Monarchies or Theocracies. +20 to −50 from opinion. The Emperor may revoke Free City status from a nation at the cost of 5 Imperial Authority and a −100 opinion malus with that country. The AI will never use this option. The Free City is no longer a part of the Holy Roman Empire, be it because it left the Empire, the Empire is dismantled, or the Emperor passes the second to last reform and the city refuses to become a vassal. The Free City annexes a second province. Free Cities may control vassals, or colonial nations. Unlawful territories are provinces that are a part of the HRE, but are owned by a Christian country that does not have a core on them. This applies even if the owner is a member of the HRE. Liberating territory from a non-HRE member that controls HRE territory will not allow for the emperor to demand it. For example, if Burgundy takes over territory on the eastern HRE front, and the player then reconquers that territory from Burgundy, the player will not get unlawful territory. If the player were to conquer that land before Burgundy it would be considered unlawful. The HRE emperor may request the owner of unlawful territory to return the province to its original owner. Being allied with positive opinion to the emperor makes it less likely that he will demand unlawful territory from a nation. However AI-controlled emperors do not actually demand unlawful territory from countries at war. To exploit this, the player can 'chain' wars back to back and core territory while at war to avoid unlawful territory demands. Also the emperor will get a malus to demand more than one province from one nation so taking two provinces and returning one and keeping the other is another option. However that will of course mean you get AE for both provinces in the peace deal. The Emperor with the support of enough member states may attempt to pass imperial reforms. The reform sequence in the game is loosely based on proposals that were made in the historical Holy Roman Empire starting in the 15th century, in order to "reform" it back into the more centralized and efficient structure it was considered to be in the 10th-12th centuries. Such reforms would have shaped it into something more like the conventional nation-states of the rest of Europe. They were usually promoted by smaller members and the Emperor, and opposed by Empire's electors and more powerful members. The threshold for proposing a reform is having 50 Imperial Authority. Once the Emperor has more than 50 imperial authority and half of the members' support, for each additional point they gain a boost to the nations' willingness to support said reforms. The Emperor's subject nations will almost always support him. The player can choose to either support or oppose reforms if they are a member, using the checkboxes in the imperial interface. By default the player opposes them. Reforms cannot be enacted while the HRE is in a state of religious war (i.e. the religious leagues exist). Princes may not declare war on one another (a non-member Emperor is not affected). Present wars are unaffected, and members may still be called into wars against other members. Co-belligerents, however, will not call their Imperial allies against an Imperial foe. Subject princes do not use diplomatic relation slots. There are no more elections for Emperor. Electors no longer vote, though they retain Elector status. Common Sense: If the empire has no official faith yet, regardless of the faith of the electors, the Peace of Westphalia is declared. Princes who support the reform become vassals of the Emperor. Other relations, such as Personal Unions, will be dropped if they conflict with becoming the Emperor's vassal. This will likely cause non-HRE vassals to become disloyal, as total military strength will increase greatly. Princes who do not support the reform will leave the Empire, receive −100 relations with the Emperor, and the Emperor gains temporary claims on the provinces that were in the Empire. Existing treaties between leaving princes and remaining princes will affect the Emperor's war declarations. 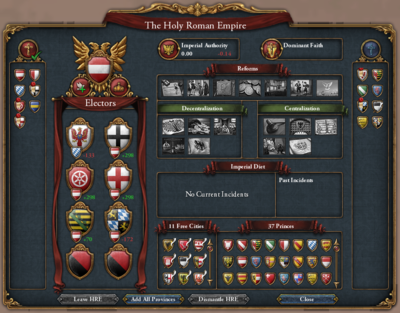 The Holy Roman Empire interface is disabled. It is still possible for princes to end up at war as a result of honoring alliances with non-members or intervening in succession wars. When playing as the Emperor, in order to get as many princes as possible as vassals, it is worth increasing Imperial Authority to a level where all or most members would vote yes for this reform. Try distributing gifts, royal marriages, alliances and other relation-improving maneuvers to members who oppose it, before implementing the reform. Once passed, if a new vassal is engaged in war, as the vassal overlord the emperor will take control, but be aware that this includes wars with belligerents both outside and inside the Empire, which may mean that instead of becoming overlord of a HRE province the player declare war on it, even if it agreed to the reform. Ewiger Landfriede means this should not happen too often, but it's something to be aware of. Due to the previous reform, the vassal relationships gained as a result of this decision do not count towards diplomatic upkeep, although royal marriage relationships will continue to. If the Emperor releases a vassal within HRE territory as an Imperial Prince, the newly released vassal will not count towards diplomatic upkeep either. A nation liberated after this reform, however, will not automatically become the Emperor's vassal. As of patch 1.22, passing this reform also changes the way that vassal liberty desire is calculated. Before the reform, each vassal's liberty desire reflects the combined strength of all vassals, in or out the HRE. After the reform, an HRE vassal's liberty desire no longer take into account his strength or those of the other vassals. Beware, however, that non-HRE vassal will still take into account the strength of HRE vassals (as that of other vassals), which can lead to a sudden rise in non-HRE vassal's liberty desire when the reform is passed. This reform is where the HRE will be the strongest, as any country that the emperor declares war on will have a large swarm of vassals to fight through. If the Empire is strong enough, they can usually take most (if not all) large Eurasian nations, even without any allies (providing the vassal swarm is large enough). A common strategy when playing as Austria and having revoked the privilegia is to rotate between targets. Attacking (in no particular order) the 3 countries that have been listed above will keep the player's army and navy tradition high and allow him/her to recruit better and better generals as time progresses. When playing as an expansionist Austria (which is recommended most of the time), it is prudent to feed captured land to vassals to make them even stronger, giving eastern land to, for example, Pomerania, Brandenburg, and Bohemia and western land (France, Spain/Castile, and maybe even Northern Africa) to the small vassals in the western part of the Empire, and taking the Ottomans, the Black Sea, and nearby steppes for the player or giving it to other members. If Art of War is enabled, consider designating your HRE vassals as marches if you don't need their territory and have a strong economy, as it will lower their liberty desire (so you can feed them even more), and strengthen their military abilities, making the swarm even more unstoppable. The last reform will consolidate all member states of the HRE into a true, unified nation, with the emperor becoming its ruler. This reform is easy to pass, as all the remaining HRE states are now vassals and will usually vote for it. This has a very, very negative impact on relations with former HRE members who left when the player revoked the privilegia - they get a special "Unified the Empire" -100 relation penalty with the emperor. In addition, there will be a lot of aggressive expansion when trying to conquer their provinces. Note that the cores the emperor gets on imperial territory of non-members will not include those that left as a result of the previous reform, since that reform already removed all of their provinces from the empire. Even if the player did everything right and made it this far by being nice and defending any and all princes (even the ones who insulted and backstabbed the emperor for centuries), it's quite likely the player will actually be weaker after uniting the empire since HRE bonuses are lost upon enacting the decision. Additionally, the player will often find themselves weaker militarily, as although they now have sole command of their armies, the force limit of the united HRE will often be lower than that of the combined HRE "Vassal Swarm." Beware that when the empire is united, all armies and navies under the command of the HRE Princes are passed on to the unified HRE, which can be devastating to finances due to being over the force limit. The player may need to disband a significant portion of their inherited military units. However, the unified HRE should still emerge vastly stronger than the emperor's original nation and may outnumber the militaries of even a strong Ottoman or France. If done right, uniting the HRE can be fun and rewarding, and will additionally net the player the "A Kaiser not just in name" achievement if playing on Ironman. If the player has managed to keep imperial territory out of non-imperial hands, expand the empire both in number of provinces and princes, and skillfully navigate the military and diplomatic trials, they may become the dominant nation in Europe or even the world. Like Germany, a united HRE does not have its own country-specific ideas and will simply carry over whatever the founding nation (Emperor) had. If the Elector is independent and does not join the war, it is "independent." If the Elector is allied to the war leader against the Emperor, it is "not independent." If the Elector is a vassal of the war leader against the Emperor, it is "not independent." If the Elector is a vassal of someone other than the war leader, and does not participate in the war fighting against the war leader, it is "independent." If the Elector is a vassal of the Emperor, or is independent and allied to the Emperor and joins the war, the Elector is "not independent" if their capital is captured. If the Elector is a vassal of any country other than the Emperor or the war leader, it is "independent." That is, in order to dismantle the HRE, it is helpful or even necessary to either ally with or vassalize the Electors, and the war must involve the Emperor and all Electors on either side. This, however, does not necessarily mean all Electors must be at war: an Elector allied to the war leader still counts as "not independent" even if it is not directly involved in the war, and if a third party (including rebels) takes one of the allied/vassalized Elector capital, the Elector is "independent" again. Dismantling the HRE will grant +100 prestige to the war leader, and remove the HRE interface altogether. In addition, the HRE will automatically be dismantled if there is nobody eligible to be elected Emperor (see above for requirements). In order to be dismantled the empire must have at least one elector. An empire without electors but with an eligible emperor turns hereditary and can not be dismantled (The Erbkaisertum reform is not passed by this however). This can happen lategame if all member states have converted to non-Catholic religions but the AI did not start the League War, leading to a Catholic emperor without eligible electors. The areas that must be within the Empire to prevent the Shadow Kingdom event. Red provinces are outside it in 1444. By the 15th century, the Empire's control over Italy was increasingly tenuous. To represent this, an event ("The Shadow Kingdom") will automatically remove the Italian states from the Empire around the year 1490, unless all of northern Italy is within the Empire by this time, or all Latin-cultured or Italian-capital HRE members are subjects of Germanic-cultured members. The parts of northern Italy that begin outside the Empire are the Papal State, its vassal Urbino, and the provinces Verona, Treviso, and Friuli held by Venice. The Rein in Northern Italy decision will also prevent the event. Its conditions are similar, but allow the emperor to hold the land via subjects, without needing to add it to the HRE first after holding and coring it directly. The decision prevents the event forever. Without the decision, the event can fire if its conditions are met any time between 1490 and 1550. If the event occurs, all AI-controlled states either in the Latin culture group or with a capital in the region of Italy will remove all their provinces from the HRE. A player-controlled nation may choose to remain in the HRE, but will incur the Submission to the Emperor malus. HRE interface while it's "in a state of religious war", with the league leaders and members on each side. At the start of the game in 1444, a ruler can only be elected Emperor if they follow the dominant religion - Catholic. However, Electors can be of any Christian religion. After 1550, if one of the Electors (that is not a subject nation) has become Protestant (but not Reformed) and the Empire hasn't been reformed to the point of becoming hereditary, then the religious leagues can be formed. Any nation may join either league, regardless of religion, including states outside the Empire, and even if they have a truce with the Emperor. The Protestant League is created and headed by the first newly converted Elector, and the Catholic League will begin with the current Emperor at the head. Any subsequently elected emperor will automatically assume leadership of the Catholic league, even if they had previously been neutral or part of the Protestant League. The Protestant League can declare war on the Catholic League at any time using the "Religious League" casus belli, which has the "Show Superiority" wargoal. If a league leader is attacked by any nation during a league war, their fellow league members will automatically join the war as defenders of the leader. This can make attacking nations in the HRE that aren't in the league against the Emperor particularly difficult, as the aggressor would have to fight the target, their allies, the Emperor, the Emperor's allies, and all nations in the Emperor's league. If a member of the Protestant League is already at war with the Emperor when the league war is declared, they are not called into the league war and their own war against the Emperor continues as normal. If any league war lasts a long time (25 years), or if it ends in a peace that does not involve either side securing the "Religious Supremacy" peace term, the Peace of Westphalia is signed, ending the religious war and allowing any Christian to be elected Emperor. This is the only way for a Reformed, Orthodox or Coptic ruler to become emperor. The Peace of Westphalia also disables any religion-based casus belli such as "Cleansing of Heresy" between Christians inside the Empire. Emperors will no longer gain or lose imperial authority for Princes converting after the Peace of Westphalia is signed, also the monthly imperial authority loss for heretic princes is halved. If the religious leagues are not triggered in the HRE before 1635, the Imperial Parliament convenes in a Diet to proclaim the Emperor's religion the sole faith with the same effect as if the Catholic League had won the league war. This will happen if none of the Electors convert to Protestant. If the Leagues do form, then after 30 years with no league war occurring, there is a chance that the Diet will occur in the favor of the Emperor. The mean time of this happening is 5 years after the initial 30 years without a league war, and it will only trigger if the player is at peace, not in a regency, and has no truces with any of the electors in the opposing leagues. Conquering provinces in the HRE and from HRE members presents three potential additional hurdles: the Emperor being called in the war, the provinces being demanded back as "unlawful territory" and 50% increased aggressive expansion when taking HRE provinces. The emperor will receive a call to war as a cobelligerent if you attack an HRE Free City, attack a member as a non-member, or attack a member with no casus belli. Note that having an alliance with the Emperor does not help, as they may still join on the defender's side. Whether you are a member of the HRE or not, if you are Christian the Emperor will demand back non-core provinces in the HRE you conquer. Take and core the province while the Emperor has a long truce with you. The Imperial Liberation CB expires in 10 years. If Call for Reichsreform has been passed, the Emperor will have a casus belli on non-members holding HRE provinces. If Ewiger Landfriede has been passed, HRE members can't declare war on other HRE members. Revoke the Privilegia and Renovatio Imperii cause would-be conquerors to be at war with the whole HRE. The Europa Universalis 4 Save Converter can be used to transfer Crusader Kings II games to EU4. If the Holy Roman Empire is transferred from Crusader Kings II while having maximum (absolute) crown authority, it will be represented in Europa Universalis IV as a unified nation. Currently, using the CK2 converter does not check all reforms as passed, and the HRE mechanics are not disabled; if the HRE exists in game as a single nation as a result of being imported while at Maximum Crown Authority, it will still be able to pass reforms. However, if the emperor attempts to pass Renovatio Imperii, the player's game will freeze. The only way to avoid this is to use the console command imperial_authority 0 to occasionally reset the current Imperial Authority, edit the mod/save files to remove the mechanics, or simply declare war, occupy the HRE's capital, and push the "Dismantle Empire" button. An imported HRE does not have its own set of ideas at present; it instead seems to use a generic group of ideas for its government type. One can go into the mod/save files and edit the ideas to whatever one wishes. If imported from a save game where the emperor and electors are not Catholic, the HRE will have religious peace. It even works for non-Christian faiths, like Norse or Buddhist. The Holy Roman Empire was the dominant political power in Central Europe during this historical period. Compared to earlier centuries, when the Emperor wielded more control over his territory, the Empire by the EU4 timeframe had become greatly decentralized, and its member states acted with great autonomy. The power of the Emperor was still considerable. He had the power to intercede in the wars and affairs of the member states of the Empire. If the Emperor can enact the reforms, he can eventually centralize all the separate nations of the Empire under his own banner, and turn the Holy Roman Empire into a unified powerhouse which in the right hands can be almost unstoppable. Alternatively, the Empire can wane in power, and, as happened historically in 1806, it can eventually be dismantled. In game, however, the Holy Roman Empire usually passes a moderate number of reforms. What happens largely is the elimination of most one province minor states and leads to an end game scenario of 8-18 mid-sized states instead of the original 50. Enact all reforms in the Holy Roman Empire. Become an elector in the HRE as a country which does not start as elector. Overthrow Austria and become the Emperor of the Holy Roman Empire. Have 7 Free Cities in the Empire, none of which is of a Germanic culture. Have at least 75 countries in the HRE. ↑ See in /Europa Universalis IV/common/static_modifiers/00_static_modifiers.txt (Static modifiers#Emperor). ↑ See in /Europa Universalis IV/common/static_modifiers/00_static_modifiers.txt (Static modifiers#States in the Holy Roman Empire). ↑ See in /Europa Universalis IV/common/static_modifiers/00_static_modifiers.txt (Static modifiers#Free Cities in the Holy Roman Empire).